NOTE: This book is in large part a work of fiction. Although the story was inspired by actual events, the names, persons and characters are inventions of the author. Any resemblance to a particular individual, living or deceased, is purely coincidental. 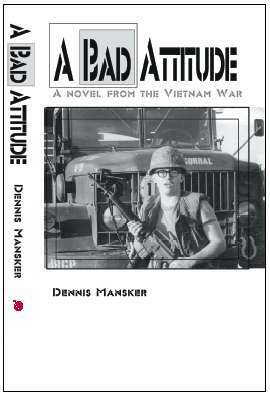 A Bad Attitude is a gripping suspense novel depicting life and death in a Transportation Corps outpost on the edge of Saigon in 1968, the deadliest year of the war. Meet Farnsworth -- disgruntled draftee, reluctant soldier and world-class slacker -- is he also a cold-blooded murderer? But if he didn't kill the sadistic Sergeant Bragg, who did? See the other side of the Vietnam War -- draftees versus lifers, the Saigon black market, deteriorating race relations and the deadly 1968 race riot at Long Binh Jail. One reviewer called it "edgy and bitterly funny" and compared it favorably to both Catch-22 and M*A*S*H. See the complete review. David Willson, author of In the Army Now, The REMF Diary and The REMF Returns, called it "an astonishing book...one of the dozen best novels set in the Vietnam War". Read his complete review. Read the first chapter yourself; if you like it and want to know more, you can buy it online directly from the publisher, iUniverse.com. It's also available from Amazon.com and Barnes and Noble Online. If you prefer to buy offline, your local bookstore can order it for you and it will be in your hands in just a few days. Now available in electronic format, in Kindle from Amazon and in E-Pub for Nook from Barnes and Noble, and for cheap! -- Just $3.03 for Kindle or $3.59 for Nook. You can also see my Chairborne Ranger website for a ton of photographs, stories, documents, maps and other memorabilia from my adventures in the Army Transportation Corps in 1968-69 Vietnam.